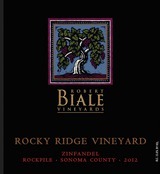 One can taste the red rock and bright Rockpile sunshine in the densely-flavored juice in our newest Biale, Rocky Ridge. Assertive Plum, plum jam, blackberry, blackberry cobbler, cherry juice and cherry pie notes hit the palate and melt into a sublime finish touched with stoney mineral, aromatic spice and dried flower notes. Elegant, balanced, and tightly packed with pure Zin-berry fruit, the 2012 Rocky Ridge has 5 to 7 years ahead of prime drinking pleasure and likely far beyond. There is earthy darkness and a hint of the forest in this Zin, grown at high elevation in the rocky soils of the Rockpile appellation, these vines planted in 2001. The wine is magnificently structured with complex, ripe blackberry and cherry compote coming to the fore slowly and seductively.